10 years and 85 days after Jackie Robinson first emerged from the dugout at Ebbets Field and strode toward first base, four ballplayers stood together under a St. Louis sun, and posed for a group portrait captured on film. The photographer caught them in a moment before the 1957 All-Star game at Sportsman’s Park; they are joking, at ease with each other and the gaze of the lens. These four men were young, entering their primes as ballplayers, ready to continue their odysseys toward four of the greatest careers baseball has ever seen. More than a half-century later, I look with awe upon this moment and this image-for I have the luxury of knowing so much more than these four men could fathom at that particular place and time. I know, for example, that the 26-year-old shortstop on the far left would soon win back-to-back MVP awards, capture two home run titles, and become so identified with his team and city that in the spring of his 77th year, a statue of his likeness would be unveiled outside his home ballpark. I know that the outfielder standing next to the shortstop-still only 21-years-old on the day the film image was taken-would become known for a ferocity and will to win that was unmatched. I know that years after capturing the Triple Crown and becoming the only player in history to win a Most Valuable Player award in both leagues, he would become the first African-American manager in baseball history. I know that the lanky, tall, smiling 23-year-old standing in the middle of the group would hit a pennant-winning home run later that year. And I know of another home run that would sail beyond the fence 17 years later-a home run that would forever link this outfielder with a man named Babe Ruth. And finally, I know that the man standing on the far right-the elder statesman of the group, but still the one who is doing the most joking, the one who can’t stand still-would continue to make every ballfield he stepped onto his own personal playground. I know his resume would include 12 Gold Gloves, two MVP’s, a batting title, and four home run crowns. Ernie Banks. Frank Robinson. Henry Aaron. Willie Mays. Each carved out an historic career-one filled with myriad accomplishments, moments of stunning artistry, and enough hardware to adorn a museum. Each would power out enough longballs to earn membership into the 500-home run club, and each would stand in front of an adoring audience in a small town in central New York, holding up a plaque that would symbolize his membership among the game’s immortals. Before that 1957 All-Star game, they had already begun their imprint on the game: Banks was making his third All-Star appearance, Robinson had been named the Rookie of the Year in 1956, Aaron had captured a batting title that same season, and Mays had won the National League MVP in 1954. Still, in this image they are babies, young men just beginning to write their own chapters. After the 1957 All-Star game, they would combine to make 52 more All-Star appearances, garner 17 Gold Gloves, earn six MVP’s, win two batting crowns, and capture 10 home run titles. I could go on and on citing statistics, but it seems unnecessary. For the names of these four ballplayers reverberate and resonate with every baseball fan, issuing a smile to anyone who chooses to remember or imagine fields and parks that once played host to Ernie Banks, Frank Robinson, Henry Aaron, and Willie Mays. When these four ballplayers started their Major League careers, baseball was still in the infancy of what Jules Tygiel called “The Great Experiment.” Jackie Robinson had been given the opportunity to write a new chapter of baseball, and the prose and poetry he composed over ten years on the diamond forever changed the game. But by 1957, Robinson had retired, and it was time for a new generation to create their own storylines. 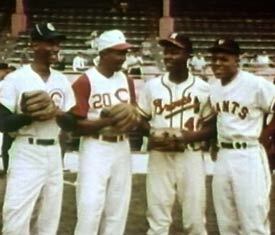 For the better part of two decades, Ernie Banks, Frank Robinson, Henry Aaron, and Willie Mays did just that. In a way, each seems to have borrowed an element of Jackie’s game and turned it into his own defining characteristic. Ernie Banks played with a joy-an emotion I always think of when I picture Jackie jubilantly clapping his hands as he skips down the third base line to meet his teammates at the plate. Frank Robinson brought an unrelenting desire to win to the ballpark-an emotion that makes me picture Jackie standing behind second base after Bobby Thomson’s Shot Heard ‘Round the World, making sure that Thomson touched all the bases on his pennant-winning home run. Henry Aaron brought a dignity and grace to his playing-the same grace and dignity that allowed Jackie to fashion a Hall of Fame career in the face of unimagined pressure and vitriol. Willie Mays could make the basepaths his dance floor and engage in a never-ending game of rundown-Jackie would taunt, tantalize, and ultimately defeat other teams as he waltzed, strutted, pranced, dared, dashed, and flew from base to base. When I look upon that image from the 1957 All-Star game, I stare into the eyes of the ballplayers, mesmerized by their youth and the knowledge of what lies in front of them. And I think of a legacy that has been passed from Jackie, through Banks, Robinson, Aaron, and Mays, and onto today’s generation of ballplayers. 61 years after Jackie Robinson stood with his teammates on a ballfield at Ebbets Field, Derek Jeter-wearing ’42’ for the night-whistled three singles through the middle of the diamond to continue his inexorable march toward 3,000 hits. 61 years after Jackie came to the plate for the first time and stood inside the batter’s box to face Johnny Sain, Ken Griffey, Jr.-wearing ’42’ on his road grays-drove a 2-1 pitch over the wall for his 595th career home run. 61 years after Jackie Robinson gave all fans the opportunity to watch his aggressiveness on the bathpaths, Jose Reyes-wearing ’42’ in a stadium less than 15 miles from where Jackie played on April 15, 1947-sped from home to third on his first triple of the season. The thread-always with Jackie Robinson as the knot-remains strong and vital. From Opening Day in Brooklyn in 1947, through a moment before the All-Star game in 1957, to the records and achievements waiting to have their time onstage in 2008, baseball keeps taking us back and forth between the past and the present, juggling and shuffling moments and images that connect us all to our national pastime and to the men who have performed so brilliantly on its diamonds. No matter what images resonate with us, they all have their starting point on some field in the past, perhaps even one in St. Louis during the summer a half-century ago, when four young ballplayers started etching their names in the book of baseball.